We're back in Kew to sample another of the areas stalwarts, Centonove. It is celebrating its 10th year of operation and it certainly has been a while since we've been here. Over Christmas the yellow washed walls have gone and have been replaced with a slate grey colour. I think it gives the place a more modern look. 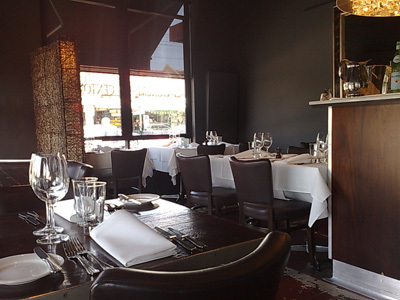 At lunch you have option of a la carte or fixed price (2 or 3 courses). The options on the fixed priced seemed a little mundane so we opted to go a la carte. 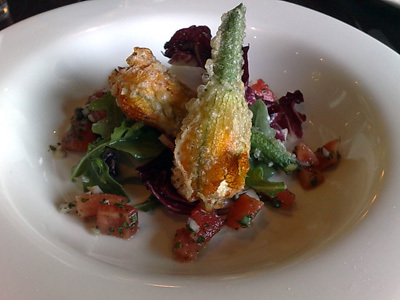 I have the Stuffed Zucchini Flowers on a rocket and tomato salad - the batter was excellent - a great combination of lightness and crispness. 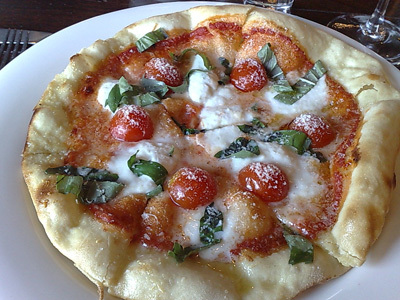 Paalo chose the Pizza with Buffalo Mozzarella, Cherry Tomatoes and fresh basil. We haven't had pizza since Rome - we were truly spoiled in Italy and neither one of us have been able to face the idea of eating what passes for pizza here in Australia. Now before you go banging on about Ladro, even Ladro doesn't compare and I don't really want to book two months in advance for pizza. The pizza came out on a very nice thin base. It certainly had one of the more unusual doughs, Paalo described it as being really "short" I thought that there must be a bit of oil in the mixture. As for the topping, well, it is a classic combination. I may have had duck last night but I'm having it again - the dish consisted of confit duck thigh and a roasted duck breast, served with sautéed spinach and a pistachio gremolata. 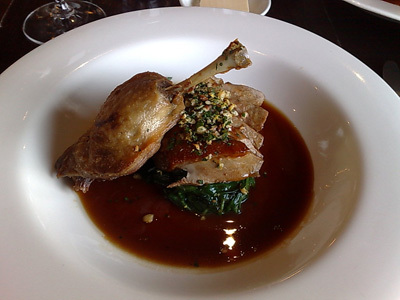 The confit duck was good but the breast unfortunately was overcooked - once again I think that is the price you pay when dining in this area. The locals don't know how to eat anything that isn't "well done" and the restaurateur's have to compromise to keep customers. If I was a chef I'd probably be beyond frustrated with plates of pink duck being returned to the kitchen. 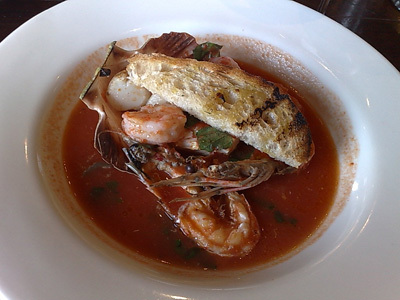 Paalo chose the Seafood Brodetto - a mix of scallop, scampi, prawn, barramundi sat happily in a spicy tomato based broth. It wasn't quite as voluminous as the photo on their menu would imply - a fortunate thing as Paalo wasn't too hungry. I ordered Poached Pears with Zabaglione due to the image I had in my mind of what the dish would be - what came out looked nothing like it. 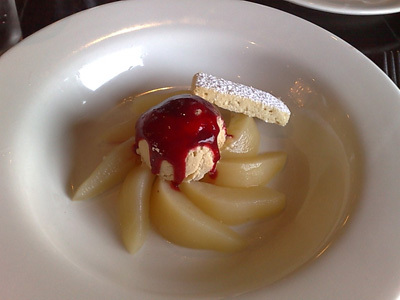 The zabaglione is actually that frozen ball sitting atop the poached pear slices. While it was nice, the picture in my mind would have been nicer. This dish would have been better with a real Zabaglione, freshly made, still warm and fluffy as it is spooned over the the pear - now that would have been much more enjoyable. 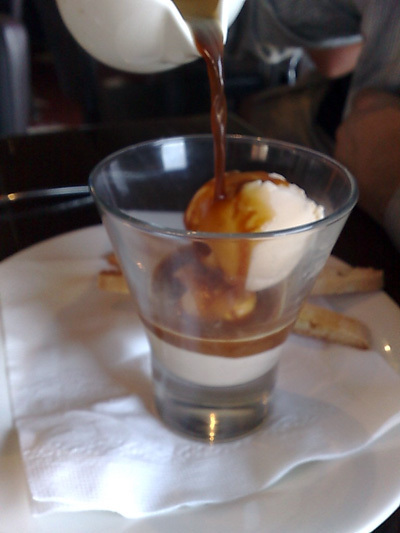 Paalo ordered the Affogato (without the alcohol) - it was accompanied by two almond biscotti.